Welcome back to my introduction to furniture painting course! ?The essential tools you need for painting furniture, is today’s subject and a very important one at that! These are my recommended essential tools you need for the best results when you go to paint furniture using milk paint or chalk paint! 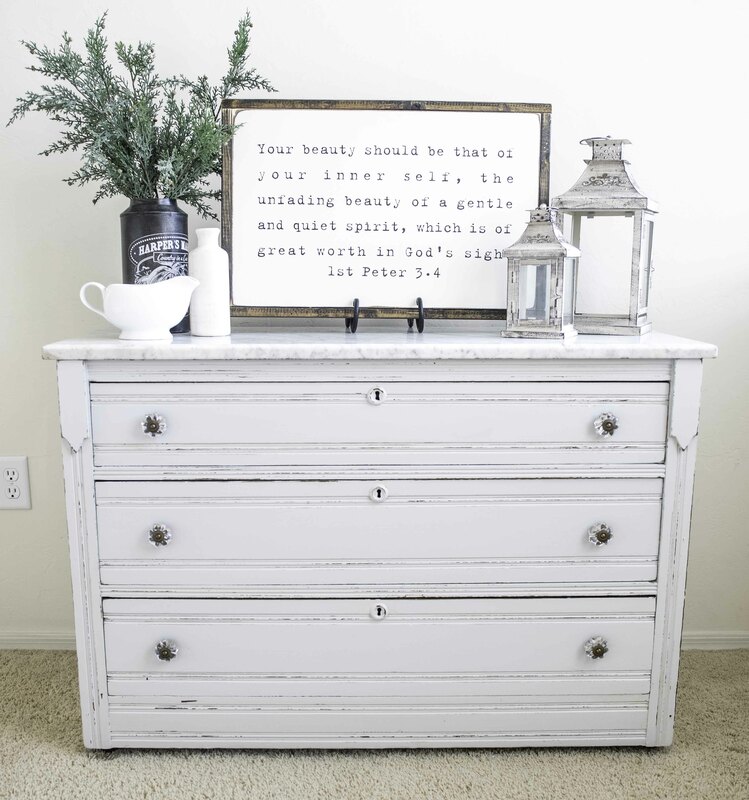 I love both milk paint and chalk paint to achieve different looks when I am painting furniture. However the tools you use when using either type of furniture paint is really going to make an huge difference on the outcome of your furniture painting project! 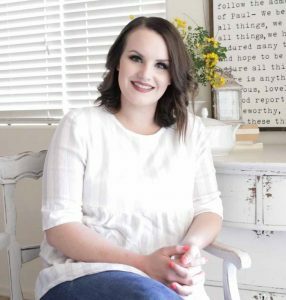 Below I will share with you each tool I recommend for furniture painting complete with an affiliate link to purchase my favorite tools recommended! -the brush is not too small or too big making it great for details and not too small to get the job done! -the bristles of this quality paint brush wont shed all over your project or in you paint can! For the above reasons this is why I recommend a quality paint brush as part of the essential tools needed to paint furniture! This particular tool is going to have the greatest impact on your overall end results when painting furniture. I have learned that second to a quality paint brush comes a solution to keep that expensive paint brush clean and working well! Nothing is more discouraging than a paint brush that only lasts one or two projects. Due to it getting all stiff and streaky due to old paint drying on and clinging to the bristles. I find that a really inexpensive solution to this problem is Murphy’s oil. -Wash clean and your brush will be as good as new! Murphy’s oil is an amazing product and it can save your paint brush even after you have left a fully loaded paintbrush to dry for days! Simply repeat the steps above a few times until your paint brush is properly working again! This is a must for the essential tools you need for painting furniture. One of the best tools I have found when it comes to painting furniture with chalk paint is a small foam roller! I love to use a foam roller for painting furniture for a really smooth and flawless application. Especially when using chalk paint because it not only gives me a beautiful finish but it really speeds up paint time! I can wiz through the painting process so fast using the foam roller on the tops sides and flat door fronts when they exist! Then I go through with a paint brush for the more detailed areas! I like to get a pack of the disposable rollers to keep on hand because I also use them for applying the top coat as well! 4. Foam Paint Brush-Small but Mighty! It may seem like a foam paint brush pales in comparison to a good paint brush and a foam roller but believe me when I tell you its essential to furniture painting! I cannot paint a top coat such as a Varathane or Polyurethane without it! Often times the top coat when painted or rolled on will pool in the nooks and crannies a little foam paint brush will help you fix that right up! 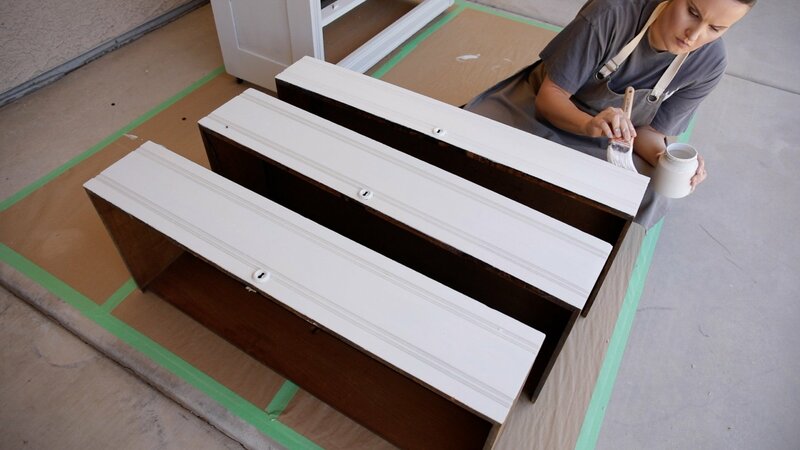 I also like to use a foam paint brush for the smaller areas such as the wood pieces between and above drawers. This is hard to paint with a foam paint roller so the foam paint brush make it easier to get smaller areas covered in the top coat. You can get a pack like this for very reasonable and then toss one after each use. The top coat wont wash out well. A paint pan is really going to help you avoid a sloppy paint job! I use this only for chalk paint. Lastly I roll out all the excess paint so that it wont drip and spray all over my furniture. I know I told you to purchase a quality paint brush but here are some reasons you my want an old one or cheaper one! Apply wax, it works for all waxes, dark, liming, and the clear furniture wax. Paint on the poly coat if a roller and foam brush are not working. This way you can toss it after it gets ruined from the top coat and not feel bad. If you’ve spent any amount of time painting you may not even need to purchase this for the essential tools you need for painting furniture. You probably already have one laying around! A Foam sanding block will be the most versatile sanding tool you can purchase. There are other options I’ll also mention in this post. However, if you have a small budget and can only pick one, a foam sanding block is the way to go! Its very easy to use a foam sanding block. Gripping the foam sanding block beats out trying to sand using the traditional sanding paper. You can really get in there and sand those harder to distress areas and put some pressure on it much easier than with paper. Its also a great tool for “roughing up” your furniture making it prepped and ready to paint! I use foam sanding blocks for both prep and distressing making a great tool with multiple uses! If you have a little bit more money in your budget and are able to invest in an orbital sander, its going to be worth every penny. I will also argue that some furniture projects will require one so keep that in mind when picking your piece to re finish! Even if you can get away with using a foam sanding block to prep your furniture project, an orbital sander is going to go so much faster. -The higher the number on the sanding pad such as 220 the finer and more smooth the sanding pad will be. 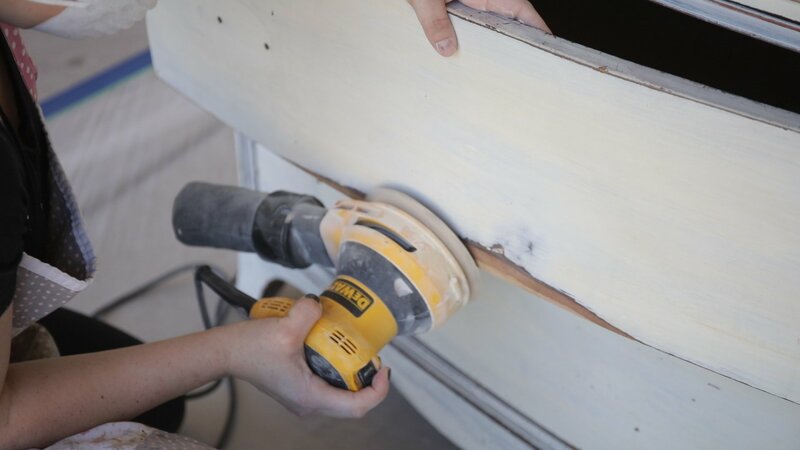 You will want to use a very fine sanding pad after you have finished the heavy duty sanding to make the final prep on your furniture piece buttery smooth! -The lower the girt such as 80 the more course and rough your sanding pad will be. This is great for sanding out scratches and dings in your furniture top! Such as an old table or dresser! Its also the best way to prep a previously painted piece if it doesn’t require being stripped first! Or even if it does! -I recommend using a lower grit more coarse sanding pad first and following up with a finer girt for the best results and a smooth finish! Even though it may be very tempting to use your orbital sander to distress your furniture. I would recommend only using a foam sanding block to distress. This will give you more control and save you from “overly distressing” your piece on accident. At the end of the day this is one of the most important on my list for?The essential tools you need for painting furniture. 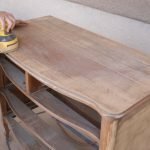 consider using deglosser if you have a very detailed or intricate piece of furniture. This is essential to keep you safe when sanding and using harsh fumes. you can pick them up very inexpensively. These are my saving grace as a contact wearer! 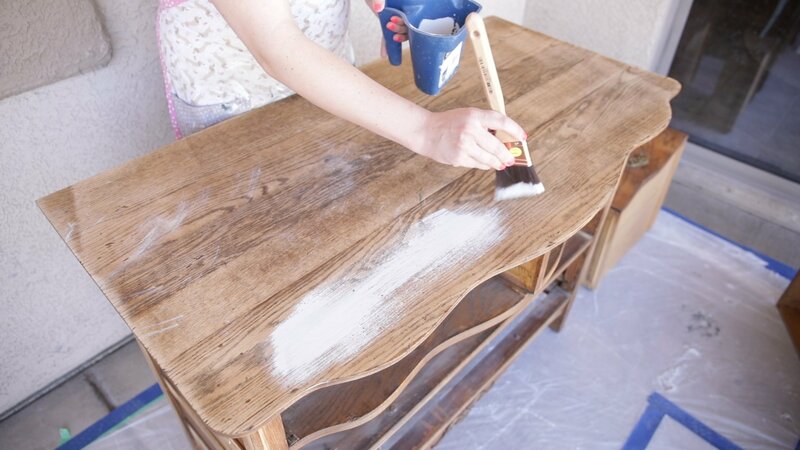 There tends to be a lot of dust kicked up in the process of painting furniture this will help protect your eyes in the process. A paint pan is ideal for minimizing drips and splashes from your paint roller! If you have a paint pan you can easily roll off the excess paint on the bottom of your paint pan before applying your roller to the furniture you’re painting. Its a simple tool but will certainly minimize the mess drips and spills! Another honorable mention that my not be necessary but will help in your furniture distressing is a metal putty knife. I like to use a metal putty knife particularly if I am using milk paint. 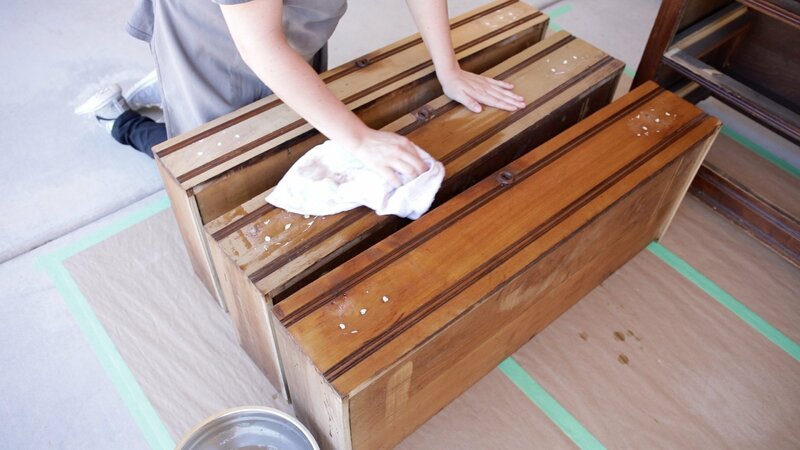 Milk paint has a lot of texture once it dries. It also may flake or distress its self in certain areas. I like to gently rub the edge of my putty knife along the edges and flaky areas of the milk paint to further distress it and really bring the piece to life! 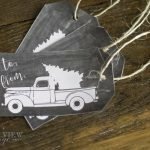 this is a really easy way to distress milk paint! Chances are this is something you may already even have on hand! I would caution against using this to distress the entire piece? of furniture. Start by gently rubbing this along the edges and flaky areas of your furniture and then follow up with a foam sanding block. This will smooth out and further finish the distressing process. lets all just laugh together at the fact that I called this little mini whisk a frother in my video. I do realize that this is not the correct term for it. However you could actually use a frother to mix your milk paint so I wont be so embarrassed about it!! lol. The only purpose I use this little whisk for is to mix my milk paint! It does the job much more effectively than lets say a spoon! If you don’t plan to paint with milk paint you can leave this off your supply list though. I am embarrassed to tell you just how many clothes I have ruined by painting furniture. Begin painting in an outfit you have either already dedicated to painting furniture or with one you are prepared too! I often will decide to pick up my paint brush on a whim and start a project only to find I’ve not made time to simply change into paint clothes. This ends poorly almost always! If you want to be really official snag on of THESE! But I just use my beloved wiener dog apron! This is one of those tools I mentioned at the beginning that is probably not necessary. But its easily my favorite of the lot! I am more efficient with a leaf blower and happier in a clean work environment. A leaf blower helps me accomplish both of those desires! I use my leaf blower to not only blow away the dust and debris from working outside but also clean off my piece of furniture in a jiffy after sanding! The bonus to the one you will see me use coming up in this series, is that its actually a two in one! My “leaf blower” is also my shop vacuum! It works mighty fine as both! You can get one similar HERE. When it comes to?The essential tools you need for painting furniture some may not seem like a priority. But if you plan to make this a regular gig this is a must! A towel is just plain handy to have around when you are painting. 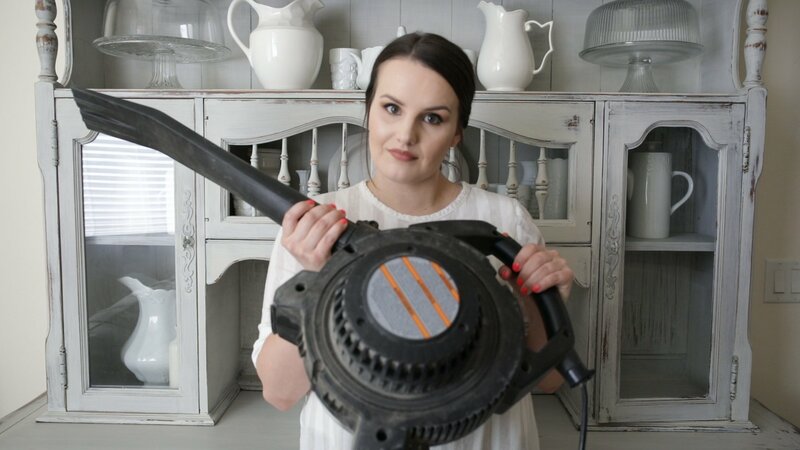 Everything from dusting off furniture to wiping up spills or drips a towel is mighty handy to have around! I prefer to use a plastic paint drop cloth when painting. I am currently renting and so its very important that I keep my work area clean and paint free. I use painters tape to secure my plastic drop cloth. This keeps it from flying up from the wind seeing as I paint outside. Keeping debris from also flying up into my wet furniture, and from the cloth hitting my wet furniture. It can also be handy if you wan to protect little areas you are painting and don’t wan to get paint on the sides or below a key hole etc. Milk paint is different from most paint mediums in the fact that it is not pre mixed. You mix it as you paint your project. I often paint outside so it is nice to have a pitcher of water to conveniently mix the milk paint as I go. This concludes the essential tools you need for painting furniture. Each of these tools has its own purpose and will really help you get the most beautiful results when you go to paint your furniture. I often find that not using the right tools can lead to some of the issues I have run into when it comes to painting furniture! The key is to set yourself up for success the right tools will help you get closer to beautifully finished furniture. It will also save you the trouble of having to run to the hardware store 10 times during your furniture painting process! This way you will have everything on hand before you begin! Thanks so much for stopping by! For more on this series An Introduction to Furniture Painting head over to the hub page where you can link to all the videos and posts that are part of this series! New posts and videos for this series go live every Thursday at 6am MST. These are great tips. I also like to use latex free gloves – when I remember!